Apologies for the prolonged silence once again. We had a fascinating time in the USA - and a part of Canada. Moving on every few days and making sure we experienced as much as possible meant no time for blogging. Now back on Lynn Rival in Grenada we're almost back to normal (and complaining about the tropical humidity of course!). From New York we made our way west through the Pennsylvania Wilds, enjoying the open countryside, seeing a lot of forest and not much activity. The roads were rarely busy and although the speed limit is 65mph or less few drivers take any notice of it. Sometimes we used local roads passing through quiet villages but then the going became very slow. When travelling we've sometimes found it difficult to find roadside eateries that suit our British tastes. 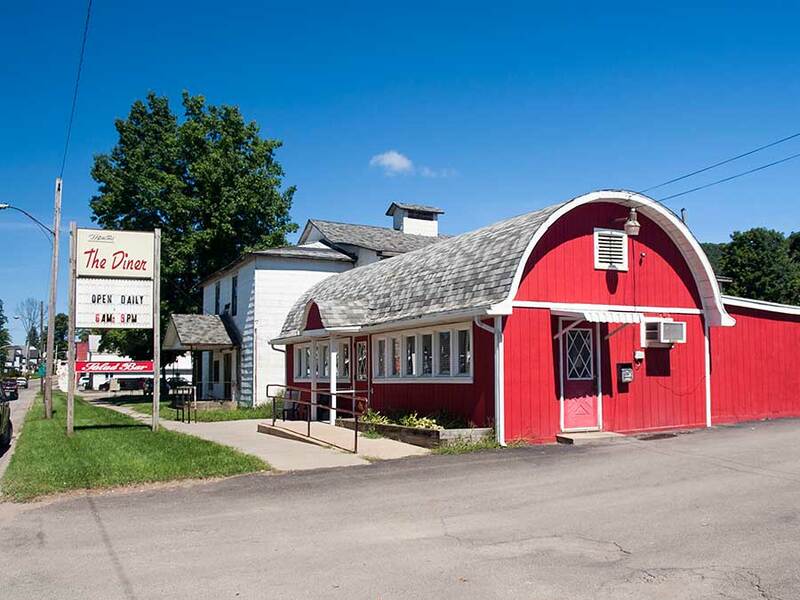 After some experimentation we came to the conclusion that old-fashioned diners are the best bet. Ah ha! I feel brunch coming on. However, their menus can be quite daunting to the uninitiated. At the beginning we would order eggs and bacon or an omelette and find they would come automatically with a mountain of "home fries" (saute potatoes, sometimes with onion) and another mountain of toast. You need to have your wits about you as a typical meal order can seem like '20 questions' - there being so many options for each item, but the waitresses were very patient, no doubt fascinated by our 'cute' accents. Occasionally 'our' waitress would announce us to the diner's regulars! We soon learned to insist on no home fries (and turn down all the offered alternatives!) and one round of toast between us. For long trips we'd plan our route with a brunch stop, having researched the diner options beforehand. After visiting the Pennsylvania "Grand Canyon" we continued towards Detroit, stopping for the night at Hudson, south of Cleveland, Ohio. Hudson has an attractive town centre with an old high street, lined with 3 or 4 storey brick buildings, but is completely surrounded by suburban sprawl (housing, malls and industrial parks, all low-rise). It was here that we woke up to the fact that when an American says that somewhere (a restaurant, grocery store, etc) is "just down the road" it may be up to 10 miles away. It took us a while to realise that downtown Hudson (the town centre) was not just around the corner from our airbnb accommodation (in the wonderfully named Sodalite Drive) but 3 miles away. You don't see many people on the streets in this part of America but you do meet them in shops and cafes and often our British accents would attract attention. After establishing our nationality and telling us about their British ancestors, people would ask where we were heading. The look of concern when told that our next destination was Detroit quickly changed to smiles when we said we would be visiting long-standing friends who live nearby, in one of the many pleasant townships outside the big D. After all, Scott and Sarah have visited us at least twice in the UK so our visit here was long overdue. 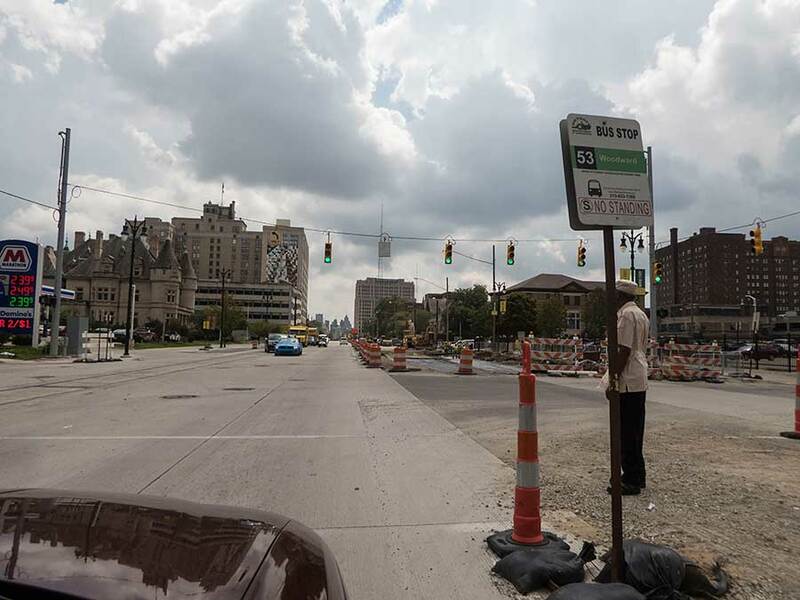 Famous for its urban decay and crime, Detroit is now undergoing a renaissance. As Scott drove us around, avoiding the worst areas but showing us some of the avenues of once-grand housing that are now in a poor state of repair, we also saw quite a lot of new building going on. People are once again walking around downtown, no longer afraid of the gangs that ruled there until recently. 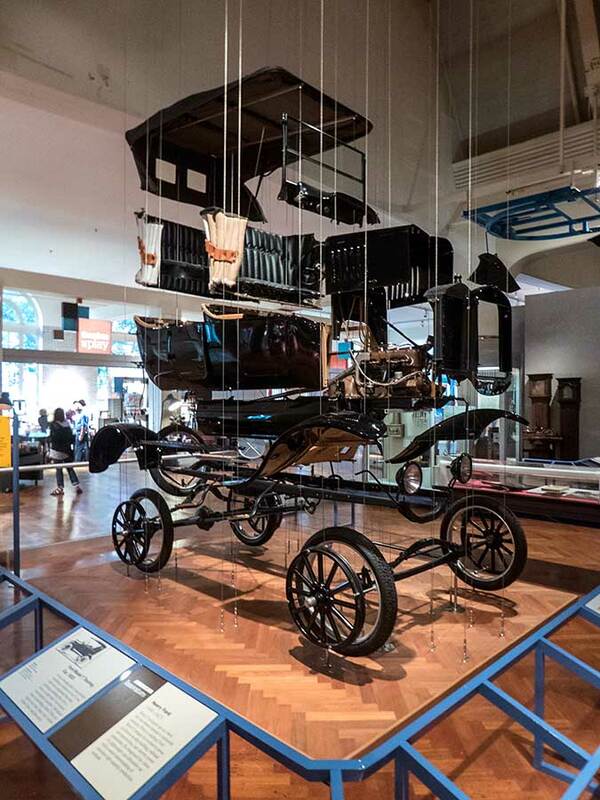 A visit to Detroit would not be complete without a day spent at Dearborne, to see all things Ford, old and new. The museum has a vast collection of vintage cars (not exclusively Ford, although Rollers were conspicuous by their absence) and transport-related memorabilia. At the nearby Rouge Factory you can walk around above the assembly line and see today's trucks being made. 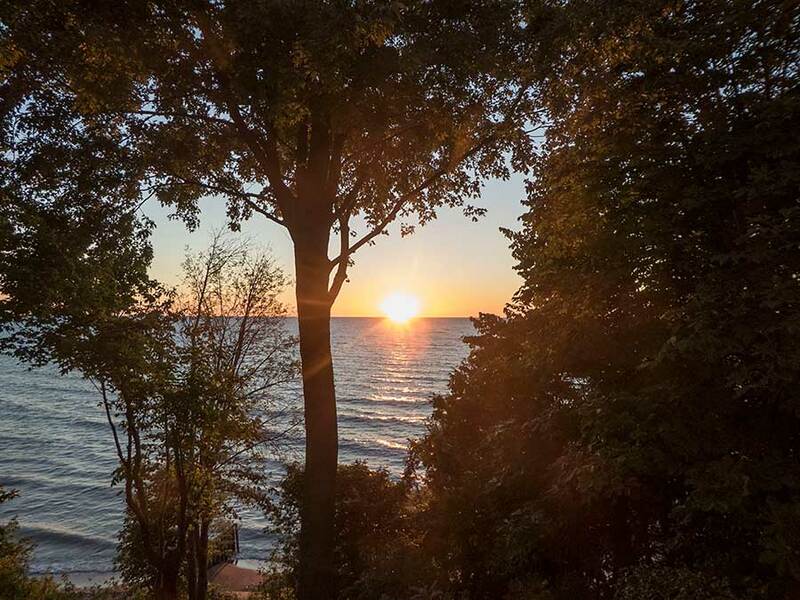 Most of southern Michigan is low-lying and dotted with small lakes, including the area where Scott and Sarah live, but they prefer to spend their spare time on the shore of Lake Huron in Canada. We were invited to join them on their Labour Day week-end visit. At the border Scott smoothed things over when an aggressive Canadian Immigration officer questioned the lack of US stamps in Paul's passport (with a full US visa you don't need stamps - and why was it any of his business?) After a short drive we reached their lakeside cottage, in a tranquil location surrounded by farming land, with just a few pleasure boats passing by, and beautiful sunsets. 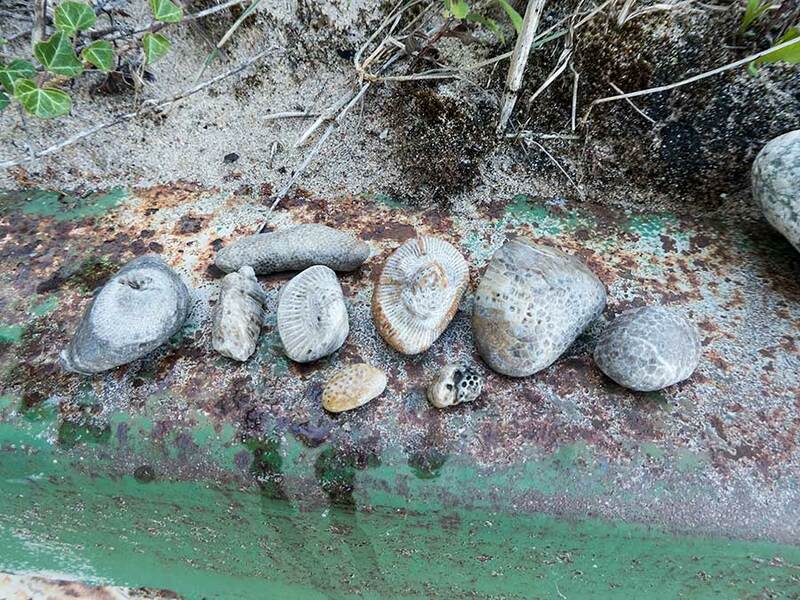 The beach is also a source of fossils and Sarah has a large collection of petoskey stones gathered while walking there. All too soon it was time to move on. We had renewed our friendship and gained a lot of knowledge, including useful maps and advice, as well as unravelling some of the mysteries of American food. Scott encouraged us to persevere with bagels (they need to be fresh and from a good bakery) and introduced us to grits (a nice, creamy alternative to the ubiquitous "home fries"). From Lake Huron we drove east reaching Lake Ontario at Hamilton, then passing through Niagara wine country on the way to the Falls. We stayed in a rural area well to the west of the Falls, away from all the tourist development. 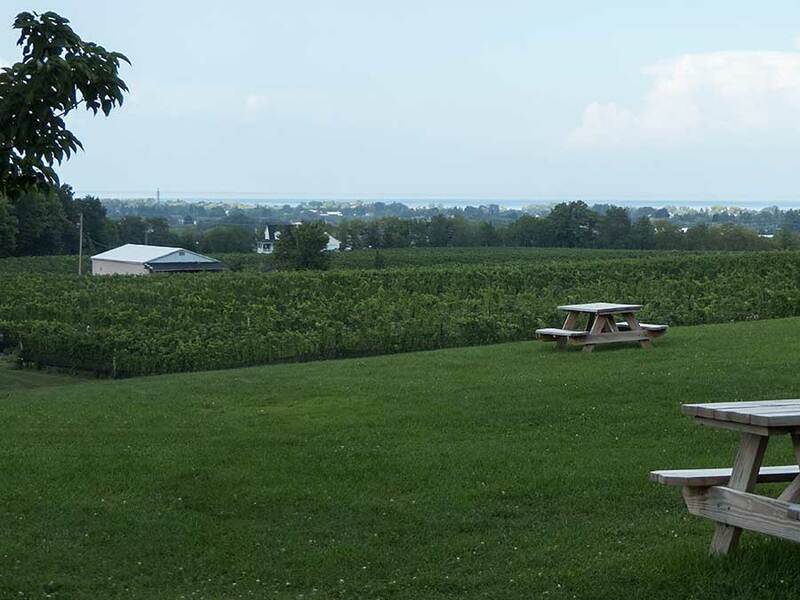 From there we explored this fascinating area where fierce battles were fought between the United States and the British in the 1812 war, the first Welland canal was opened in 1829, the Fenians invaded in the late 1860s and more recently a serious wine industry developed along the Niagara escarpment. These grapes are harvested at -10 to -12 °C to produce ice wine - I hope the pickers are allowed gloves! We found the Niagara Falls disappointing and didn't spend much time on them. Their raw beauty is overwhelmed by all the tourist development and they are no match for the Iguazu Falls on the Argentine/Brazil border which we visited 3 years ago. 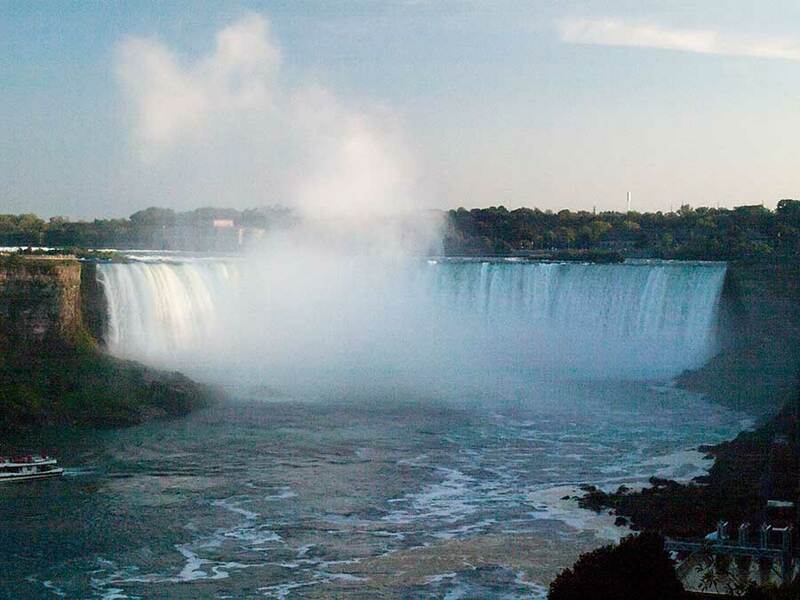 It was interesting to find that the flow during defined tourist times is specified in contracts with the hydro companies, who would otherwise reduce the falls to a trickle. 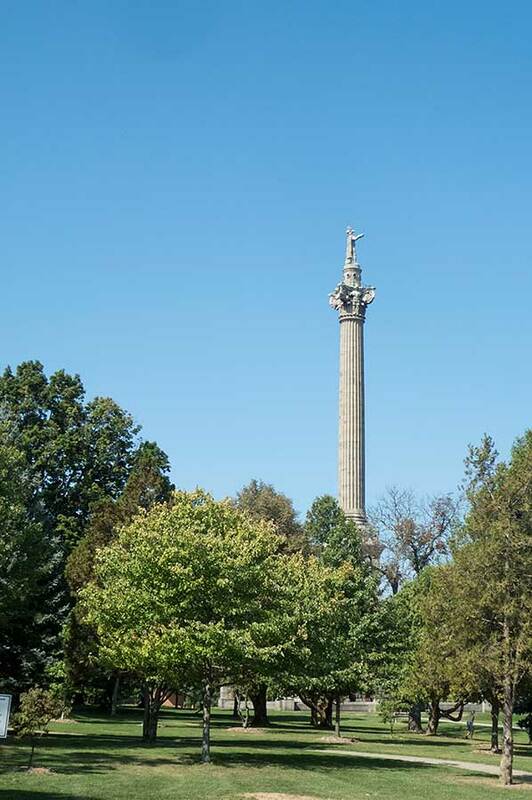 As some Canadians pointed out to us, the military and economic developments in the area are as much part of British history as theirs. 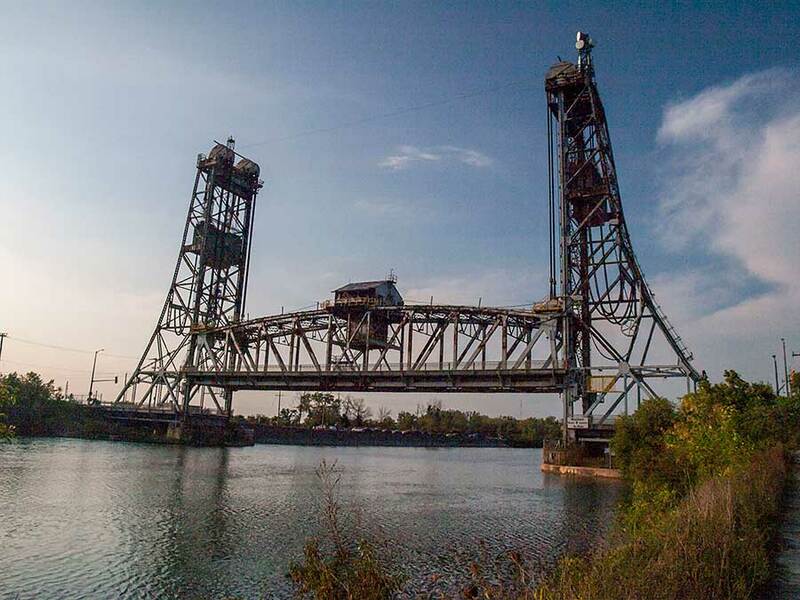 The Welland Canal was an important development enabling shipping to avoid a portage between Lakes Erie and Ontario. As with most major infrastructure projects it faced political, financial and engineering challenges in the beginning but with 19th century perseverance and growing use it evolved into the modern canal of today. We enjoyed travelling over the lifting bridges that cross the canal and the set of locks that take ships up and down the 100m Niagara escarpment is spectacular (disappointingly we were not allowed to watch the locks in operation at close quarters). 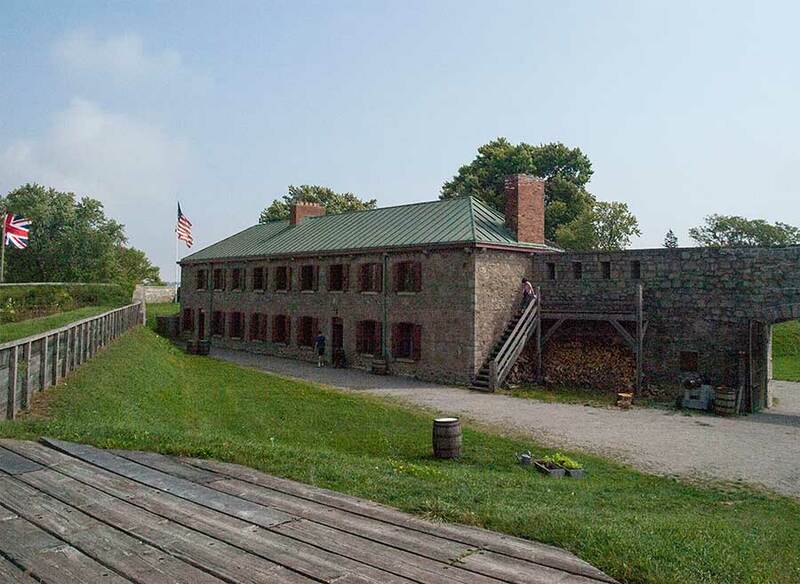 In the southern corner of Ontario the Fort Erie museum is a good place to learn about the history of the area (which of course goes back thousands of years) and especially the battles between British and US forces during the 1812-14 war. Crossing back into the US was straightforward. Driving a hire car with Massachusetts plates probably helped as the checkpoint officer simply asked how long we'd been in Canada.